Winds gusting at more than 70 mph churned up a dust storm that roiled through the Texas South Plains during the Monday afternoon commute. Dust kicked up by westerly breezes ahead of a strong cold front restricted visibility in Lubbock to about 5 miles all afternoon, said National Weather Service Lubbock meteorologist Matt Ziebell. That was nothing compared to the 8,000-foot-high rolling dust cloud that moved through the city just before 6 p.m., dropping visibility to between zero and less than a quarter of a mile, Ziebell said. North winds gusting as high as 74 mph had begun forming the dust cloud about 100 miles north of Lubbock around 4:30 p.m., he said. "It went from light to dark, just like that," said Lubbock convenience store clerk Alma Williams. "I've never seen anything like it. It really scared me." 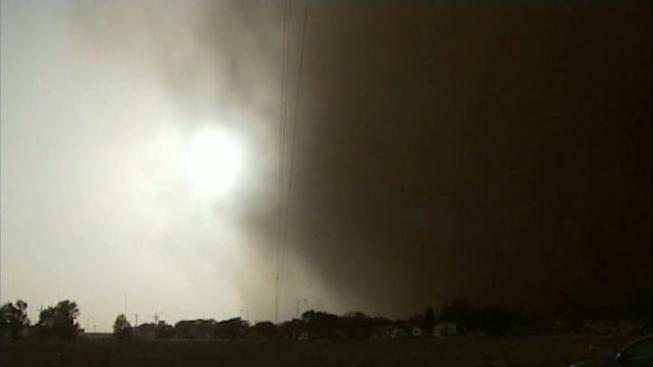 Lubbock city spokesman Jeff McKito said he was driving home from work when the dust hit. "It was pretty spectacular. Everything just turned black," he said. He said cars pulled over and stopped, "but you don't want to get out of the car in this situation," he said. FAA controllers at Lubbock International Airport had to evacuate the tower and direct air traffic from a backup center on the tower's ground floor, McKito said. Trees toppled, roofs lost shingles and a small cargo plane at the airport was overturned, he said. No injuries were reported from the dust cloud reminiscent of those shown in Dust Bowl photos from the late 1930s. The dust cloud was yet another byproduct of the persistent drought in West Texas, Ziebell said. The U.S. Drought Monitor map released Oct. 11 showed much of Texas, including the South Plains, were still experiencing "exceptional drought" -- the most severe category. In an Oct. 6 statement, the National Weather Service in Lubbock reported that there was a "high likelihood" that 2011 could be the driest on record across the South Plains. The wall of dust darkened skies and stopped traffic, while the winds caused widespread minor damage, downed power lines and toppled trees.